Domenico Nicola DiIorio first appears in the Painesville, Ohio, area in 1908. In America, Domenico Nicola DiIorio was known as Nick DiIorio. Domenico Nicola DiIorio, son of Filippo DiIorio and Maria Filomena Vitolone, was born on May 29, 1890, at Frosolone, Italy. He married Maria Cristina D’Abate, daughter of Giacomo D’Abate and Maria Felicia LaGamba, on January 6, 1914, at Italy. Domenico died on March 14, 1970, at Lake County Memorial Hospital at Painesville, Lake County, Ohio, at age 79. His body was interred at Riverside Cemetery at Painesville, Lake County, Ohio. Domenico Nicola DiIorio first immigrated to the United States on January 23, 1908, at age 17, travelling to Painesville, Lake County, Ohio. He was joining his brother-in-law, Egidio Zampini. 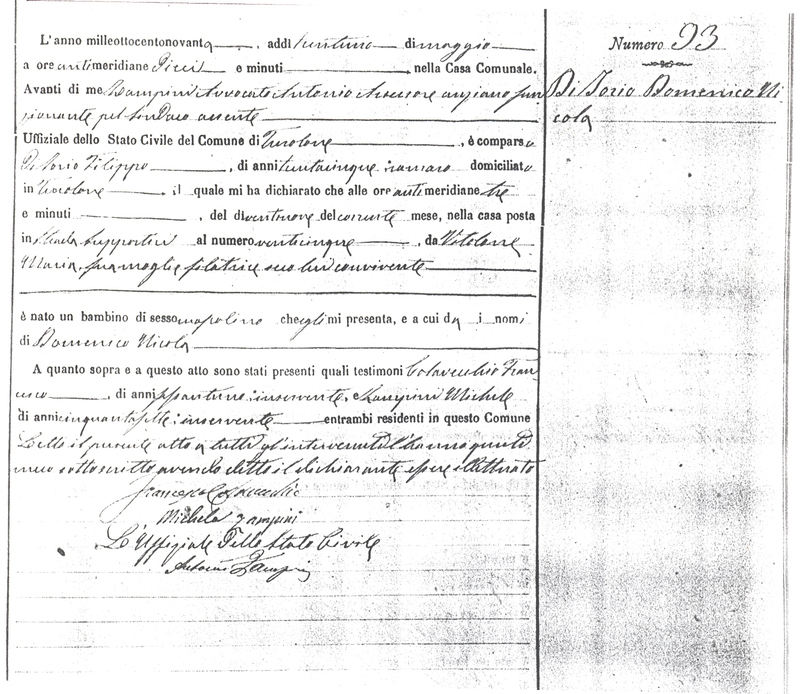 Nicola DiIorio re-entered the United States on November 8, 1920, returning to Painesville, Ohio. His wife, Maria Cristina D’Abate, remained in Frosolone until December, 1921. Nicola DiIorio became a citizen of the United States on September 30, 1929. Nicola resided at 90 Sanford Street, Painesville, Lake County, Ohio, when he was Naturalized. Three of Nick DiIorio’s siblings also lived in Painesville, Ohio. 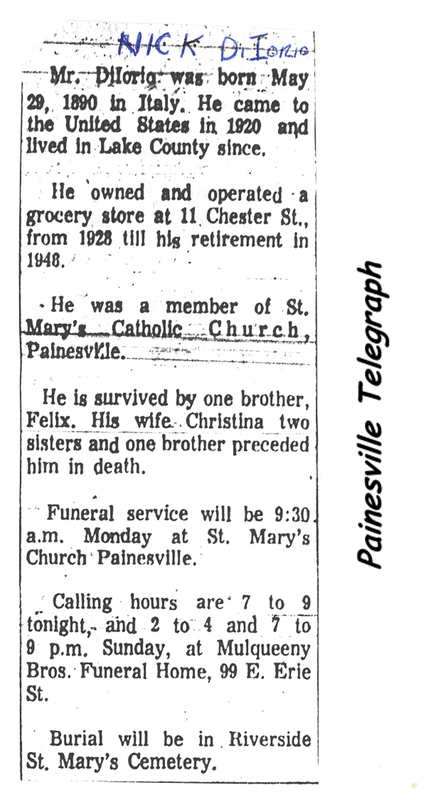 His sister, Maria Giuseppe, immigrated to Painesville in 1904. 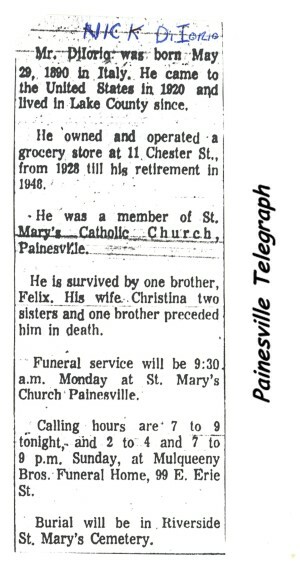 Brother, Felice, immigrated in 1920. Sister, Maria Donata, immigrated in 1921. Mr. DiIorio’s mother, Maria Filomena Vitolone, was a first cousin the Painesville Square family’s mother, Maria Giovanna Vitolone. 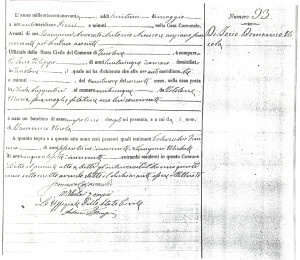 There were no children of Domenico Nicola DiIorio and Maria Cristina D’Abate.